Called “Words Create Worlds” (try saying that 10 times), the exhibition consists of Zorn—an Art School instructor of calligraphy and watercolor—painting the walls of the Nanogallery in purple words along the lines of “gratitude” and “peaceful”—no surprise considering Zorn’s staple zen-like demeanor. Zorn’s exhibition is properly aligned with his skills. 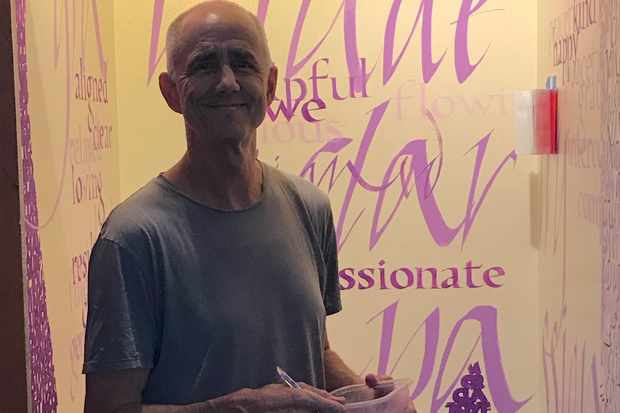 He’s a longtime calligrapher, having been doing it since the late 90s. He has experience working on quotes, certificates, wedding signs—you name it. But once the North Carolina native moved to Hawai’i, he struggled to find classes that would help improve his skill. Thus, he started teaching. Before working at the Art School, Zorn taught similar courses at Kapi’olani Community College. About a year and a half ago, he reached out to the former director of the Art School Vince Hazen and hasn’t looked back ever since. 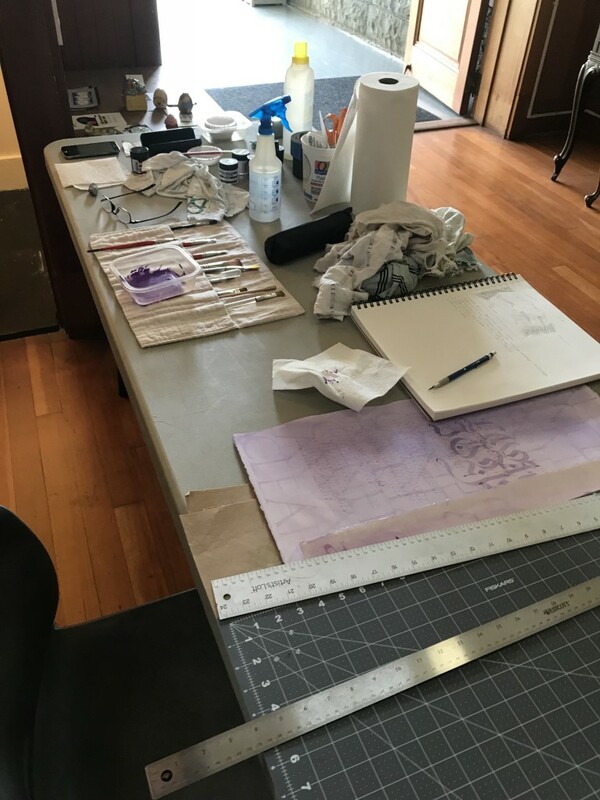 Although he’s not quite done yet on Wednesday afternoon, we chatted with Zorn to get the behind-the-scenes scoop on what it’s like to create the Art School’s latest Nanogallery exhibition. Tell me more about your relationship with calligraphy. It’s like meditation practice where it’s calming for me. Whereas here, it’s strange—people are walking by looking at you and there’s noise all over the place and I’m working in weird positions. It’s very different than when I’m home and I’m sitting and I’m quiet. Why is your exhibition called “Words Create Worlds”? It has to do with a thing called Appreciative Inquiry. One of the principles is called the Poetic Principle. It basically states that we are the poets of our lives and we choose what words we privilege, what words we choose in conversation, what words we have going on in our heads. This is a sort of exploration of that concept. What would it be like if these were the words that we privileged all day long? Would it create another world or not? I spent the last couple of years diving into that concept. It’s based on the idea of how important language is in our everyday life and shaping our own lives. [In addition to adults] I teach high school kids and little elementary kids too. One of the things I teach them is mindfulness practice. In that practice, you’re always confronted with this internal dialogue and what’s going on with that. I think it’s interesting to see where other people are, how they relate to the words that they use. This is the kind of stuff I do everyday in my calligraphy practice, I’m always conscious of the words I use. This exhibition is an extension of that. How is it working with the small size of the Nanogallery? For me, it’s a large space because I’m used to working [with paper and canvas]. I’m used to working really small. But here, it’s a chance to break out bigger brushes, try something experimental. The small space makes it good, it’s not like a whole wall I have to fill, it’s a reasonable amount of bigness. It’s somewhere in-between what my comfort zone is and totally overwhelming. Because it’s an enclosed space—it kind of wraps around—it sort of helps the experience of stepping in and imagining if these are the kind of words that go on in your head or do you have a different set of words that you tend to perpetuate. Are you even aware of the kind of words you tend to perpetuate all day long? 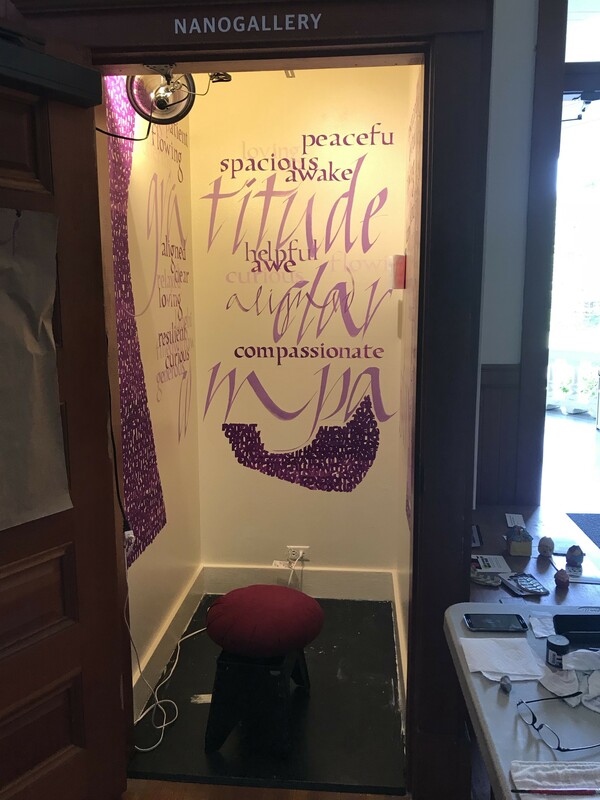 How come you chose to express your words in only purple paint? It was one of those things where it’s creative limitation, where you have all these choices of colors and it’s very easy in a space which is much bigger than what I’m used to to just throw the whole palette at it. I thought it’d be interesting to limit. Secretly, there might be some gold in it, a couple of splashes, I don’t know. But mainly for me, certain colors evoke certain feelings, emotions, mind-states, perhaps. I think through history and a lot of different traditions, purple evokes—or invokes— some sort of regality and nobility and uplifted-ness. Zorn’s Nanogallery exhibition will be up until June 28 in our Art School. See it for free! Very nice! Ill take a look at it this week.